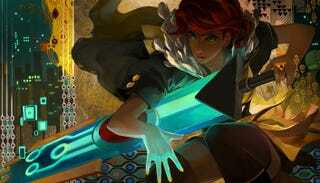 Sometimes, I need a game like Transistor to waltz into my life. Just when I was becoming frustrated with an underwater driven exploration side quest that lead me to my fourth random encounter in a span of a minute in Dragon Quest VI; just when I was bordering on boredom having to farm my next golden stag on a sleepless night to pay off a ridiculous sum of a virtual home loan in Animal Crossing - Transistor's vibrant yet chilling green glow of pulses and electrical wonder sauntered in to my rescue. With it, it brought what I needed to break up the methodical familiarity of the JRPGs I so love to engage in. It gave me a more modern world to make a connection to other than the ones filled with knights and heroes of legend. It instead gave me a purpose to unravel a dying world's mysteries on the sultry heels of a female heroine - a woman charged with ambition, vengeance and burdened by intricate plot schemes unfolded only by hints in profiles uncovered, and clues that revealed more by saying less in the fragments strewn between the lines. As with any amazing world building experience, the visuals and story of any game is made complete by a beautiful soundtrack. The best games are ones that manage storytelling not just through words or art but will infuse music to do same. Transistor is one such game that helps to imagine a world that is dark in its narrative but brought to life through the music breathed into it. The story's protagonist is one Red - a singer who is robbed of her vocals. The music captures every step she takes and her explorations into a sort of technological atmosphere with a certain distinctive quality. The music is not necessarily there to literally act as her replacement for her voice and her emotions, as her companion does that for her on a certain level. However, the entire game is stitched together by her actions, her text-based communication, those clues unlocked, news segments, voice messages, visuals and at the center of it all: its music that is closely intertwined as key elements to convey parts of the narrative. My mind wandered when I listened to the music during Red's exploration of her world, Cloudbank. Early on, when I encountered one particular tragic acquaintance of hers, I was reminded of Parasite Eve. I had forgotten how much I adored the final boss theme, "U.B.". Like "U.B. ", the track, "In Circles" has that modern sensibility with what can only be described as having a similar sentiment of a grandiose opera's dramatic presentation. Like "U.B. ", it's an epic tale woven under the futuristic sounds. It's more low key. Less bombastic but it's emotionally evident given the context. "In Circles" is a case of a game being unable to be separated into two distinctions: from game to soundtrack. The song becomes the story. And as the battle continued in that particular moment, the song broke down - it literally felt like a digital degradation in its nature - to reveal more of that haunting narrative. It's something that I would fully come to understand later on as certain truths were revealed. Much of the story in Transistor is integrated by way of its soundtrack in this way. Suffice to say, there should be a spoiler warning needed should you choose to listen. In committing myself to Red's endless pursuit of knowledge in trying to piece together her betrayal, I could not help but recall The Bride in Kill Bill. The music set the pacing and reflected a particular tone. I thought of Kill Bill's usage of the traditional mixed with smooth, unassuming beats and rawness of popular culture. Transistor, at times, achieved something similar. Transistor's fantastic journey will soon be at an end for me and with it, my memories of the nights I spent awake much too late trying to uncover characters' motivations and a compelling, daunting sci-fi narrative. Its soundtrack, however, will be the thing that I remember most - the one that I enjoy for its thrilling sounds. The often somber musings it relayed. The stylish quality it injected in its delivery. It's the one that has reminded me how exciting and dynamic video game music can be. It's the one that will be in heavy rotation in the years to come. Visit TAY Classic for a bleak, dystopian future that will at least have awesome music to get you through. YAY! Take a break at Jan's and have the special. While there, serve up some discussions on life, video games and anything you want. If you are new to TAY and would like to know how it works, please give the tutorial a read.